Yesterday, as my wife and I walked down Monroe from Park Blvd., where we voted minutes earlier, a friendly feline snatched our attention. I had seen him several times previously, even featuring a distance shot with skeletons on Oct.13, 2016. Days later, the boney Halloween decorations, which I also photographed there a year earlier, mysteriously vanished. I can’t guess why. 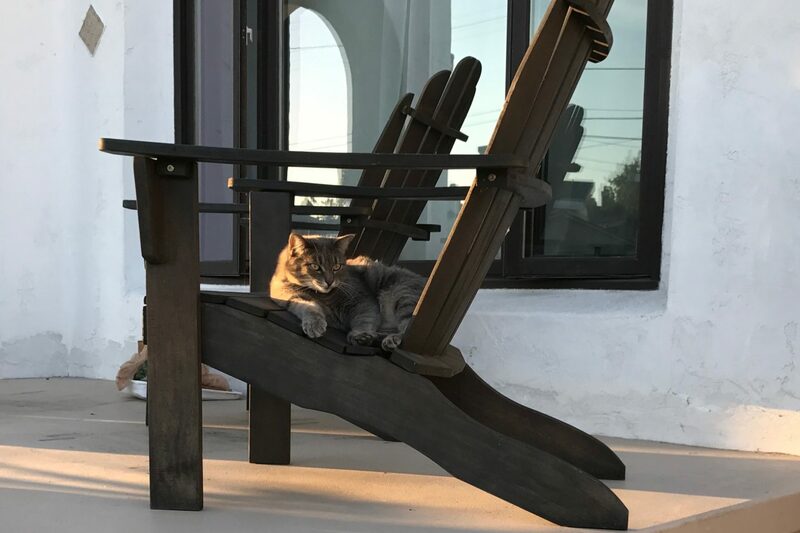 I call the cat Cozy, not knowing his real name, but seeing him so often sitting or lounging on one of the porch’s two chairs. I captured the moment, at 4:21 p.m. PST, using iPhone 7 Plus. Vitals for the Featured Image: f/1.8, ISO 25, 1/251 sec, 3.99mm. The photo is an 80 percent crop. Other featured felines: Scruffy, Roly Poly, Woo, Skull, Biscuit, The Colonel, White, Chipper, Frisky, Stretch, Needy, Farfisa, Mates, Hunter, Pee-Pee, Blue, Blue Too, Bonded Pair, Patience, Fess, Jumper, Frenemy, and Looker.